And raise lots of money for good causes. The basic idea is very simple. Participants ask people to sponsor them to take part in a fun run. But this is a race with a difference. 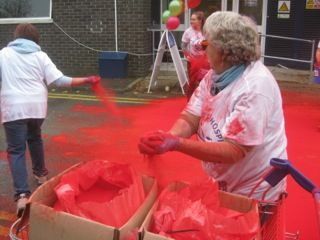 At certain points along the route they will be bombarded with coloured powder. By the time they cross the finish line they will be every colour of the rainbow. 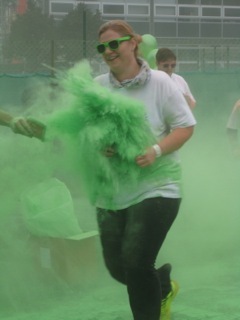 The coloured powder used is of course totally safe, biodegradable, easily wash-outable and very very colourful! Although the powder is harmless most races require you to wear swim goggles or plastic sunglasses. 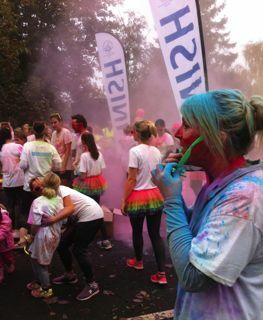 Colour runs are usually organised by specialist fundraising companies who set up runs or races in different locations usually larger towns. These companies often have a main national charity that they support. At many events however you are welcome to raise money for their own favourite good cause. Participants pay to take part. It usually costs around £15.00 / $20.00 This is how the company pay for the event and make a profit. Participants will then also collect sponsorship for their charity usually through online giving sites such as Virgin Money . 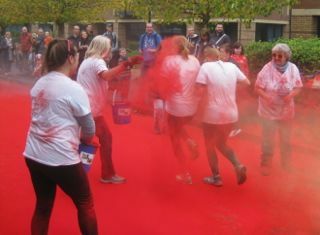 Some larger charities and increasingly hospices are using these colour companies to stage events specifically for them. Participants are usually required to wear white clothing to better show off their coloured selves later. They run along a designated course usually stretching anything from 1km to 10km. Why spectate when you can join in the fun. 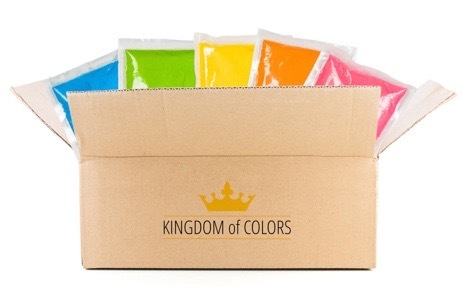 Family and friends can also purchase packets of colour to throw from the sidelines deliberately targeting anyone they know who runs past. 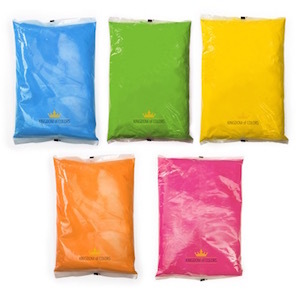 It is now pretty easy to buy coloured throwing powder from fundraising companies and specialist suppliers. This has led some organisations to organise and stage their own events. Sometimes these are normal colour runs. A new variation however is simply a colour carnival. 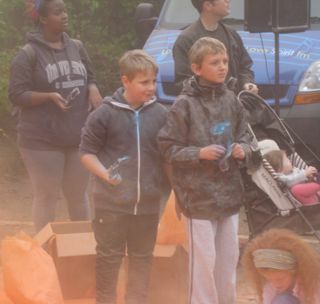 Participants buy a place on a sports pitch and as much coloured powder as they can afford or carry. When a whistle blows its colour carnival time. Make sure you have extra supplies of powder ready to sell because no one is going to let their friends throw the last handful! 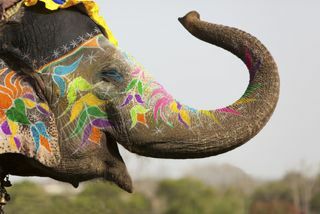 Holi is an ancient Hindu festival also known as the Celebration of Colours. It is celebrated in India and many other parts of South Asia, and also increasingly in other countries where significant populations of Indians live. After a night of celebrations the next day people spill out on to the streets to party, frolic, throw and generally get covered in colour. 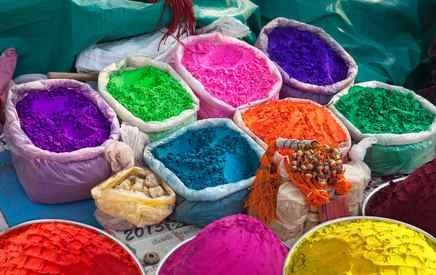 The colour is harmless vegetable dye (called Gulal) of every hue imaginable. Some people also drop and throw balloons of coloured water. People move from place to place visiting family and friends with everyone continuing to throw and paste each other with colour. Anyone on the street is fair game for the celebrants but the whole affair is a joyous celebration of togetherness and fun. The walls and streets too become covered in colour giving the whole town a very festive air for some days until washed away by rain. In England we spell it Colour Run in the US Color Run. Both names are actually the trademark of one company. There are also a number of other companies all keen to help you put on similar events.